What a customer needs to think about when choosing the right PAT Machine ? 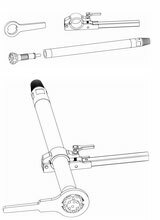 Pat specialise in the manufacture of drilling machines but essentially supply a complete package of accessories to work with the drilling machine – such as mud pumps, air compressors, drill pipe, drill bits – and all the other tools required through to the full completion of construction. This is the essential first step – define the borehole design – will the borehole be lined with casing & screen to what likely depths. To understand this you will need to know the geology the borehole will be constructed in and the occurrence of water both what depth it is located and what depth it will rest below the surface. The primary essential consideration is to have a design that houses the selected pump and then a inflow or screen section that will complement the pumps capacity. Also check out comments made lower about choice of well lining materials. The borehole diameter and depth. Leading on from the borehole design will be an assessment of the average depth with contingency for a maximum depth, a diameter of borehole to be drilled and in what sort of geology. 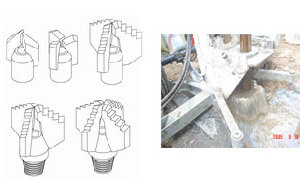 PAT drilling machines construct holes with the following main drill methods. This is used in sedimentary formation such as sands, gravels, clays and very soft or lightly cemented or weathered rocks. It uses a circulation of water from mud pits into a mud pump and through the drill pipe is wash to surface the drilled rock material – the fluid in the hole also hydraulically supports the borehole walls from collapse until casing is inserted. The normal drill bit used is a drag blade and these are manufactured by PAT in a huge variety of diameters – sized to drill inside casing and outside – ie to make a hole big enough to insert casing. Once a drag blade finds the rock too hard to penetrate then the ground is better drilled with ancompressor and down the hole hammer. When drilling with compressed air a water injection pump can be used to help the drilling action – lifting material from the hole – these are built into all PAT wheeled machines – supplied as separate units on 301 Skid machine. When drilling with Down the hole hammer – most compressor units outweigh the PAT drilling machine they complement. Well casing, screen, gravel pack and well apron construction materials all have to be efficiently hauled to site. Often a typical mobilisation will cover a ‘black top’ journey on reasonable public roads that are well used by cars & trucks – but then the final few kms onto a pegged site might be ‘off road’. A fully cost & time efficient drilling operation aims to transports equipment to a site in the minimum time and road miles traveled. By equipment & material choice keeping the total weight of the ‘mobilisation’ to a minimum helps achieve the optimum. PAT default option is to supply equipment on rugged off road trailers – so the investment made in expensive vehicles make those vehicles fully available and adaptable for all the transport requirements of a drilling operation. Observations made over the years – a light, powerful 4WD pick-up may be able to access sites but can total up a lot of time and distance traveled making multiple trips to move equipment to a single site. In comparison a heavier truck can fail to make a vital river or stream crossing due to being too heavy for the existing structures. Fast ‘black top’ vehicles can bog completely and cause long time delay whilst a slower more capable off road vehicle on the black top will be the more efficient. PAT do not generally supply vehicles – only if especially requested. Mud Drilled holes need careful development after well screen is placed – the most convenient method is compressed air – but a small volume development compressor will achieve this job – without having to deploy a machine with capacity to air drill on its own. Once a hole is completed it is good practice to undertake a nominal test pump in part to clean the water to drinking quality and part to determine the possible flow rate and pumping level for a permanent pump installation. PAT make integrate sets of equipment to do this work. There are many ways of applying cost effectiveness rules to the purchase of drilling equipment each purchaser will have different criteria to arrive at the correct package to purchase. All PAT equipment is designed and built for an arduous life on site – and would generally be expected to work its first 12 -24months without a huge maintenance cost. The simple basis of choice is the drilling depth and diameter to be drilled – the larger the machine the greater weight of drill pipe it can carry in a hole and the deeper it can drill – the larger the machine the more powerful the rotation and the total mass so it is easier to put weight on the drill pipe. When drilling rock – the dominant requirement is compressed air – the more air that is available in both volume and pressure the faster the drilling will be resulting in the lowest cost per metre – provided production can be constant – ie numerous holes lined up to be drilled one after the other.